Rowing is a cyclic type of sport where similar movement patterns are continuously repeated. Rowing injuries are therefore a common practice while minimizing their occurrence and monitoring the athletes is every coach’s responsibility. Here is an overview of a research article by Boykin et al. (2013) on the topic of rowing injuries. The authors go into details of labral injuries of the hip (labral tear) in adolescent and young adult rowers. It is not very common in rowers but can cause severe pain and discomfort. 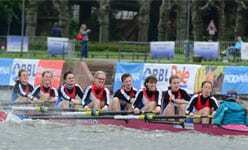 Injuries in hips of adolescent and young adult rowers receive more and more attention as more is studied about femoroacetabular impingement, labral pathology and hip arthroscopy. The authors of the present study carried out a review from 2003 to 2010 to identify rowers who suffered from labral injuries of the hip. Twenty-one hips (18 rowers, three with bilateral labral pathology) were analyzed in the study. Demographics, symptoms, physical findings and location of the labral tear were recorded. The mean patient age was 18.5 years (range 14-23 years). Most of the rowers (85%) were female. The findings indicated that 71% of the patients had isolated groin pain. All patients reported that their pain was worse during activity. All of the 18 patients had arthroscopic surgery, 10 of them (56%) returned to rowing. Six (33%) never returned and no data were available for two (11%) rowers. Rowing injuries are quite common due to the repetitive movement patterns. The repetitive hip flexion required for rowing might be one of the mechanisms causing labral injuries of the hip. Coaches of adolescent and young adult rowers should monitor the key markers, including groin pain to quickly react to possible pathology as hip arthroscopy could help rowers return to sport. There is a suggestion that underlying anatomic abnormalities of the hip such as femoroacetabular impingement may predispose certain patients to these injuries. Boykin RE, McFeely ED, Ackerman KE, Yen YM, Nasreddine A, Kocher MS. Labral injuries of the hip in rowers. Clinical Orthopaedics and Related Research 2013; 471: 2517-2522.